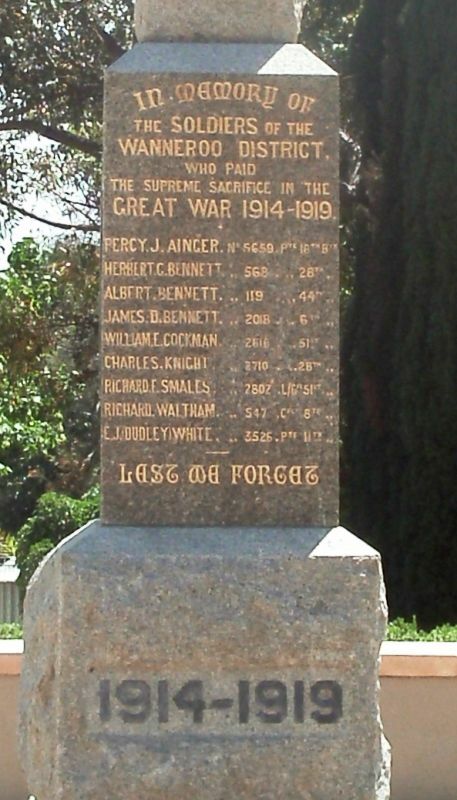 The Wanneroo War Memorial commemorates those who died in service or were killed in action in World War One. The Wanneroo War Memorial was originally unveiled on the 3rd September 1921 by Mr. H.P Colebatch, Minister for Education in front of the local Post Office on Wanneroo Road. Of the 23 men who enlisted from the Wanneroo District nine men fell and they are honoured on the memorial. The West Australian (Perth) 5th September 1921.